← Monuments Men, George Clooney, and Europe. 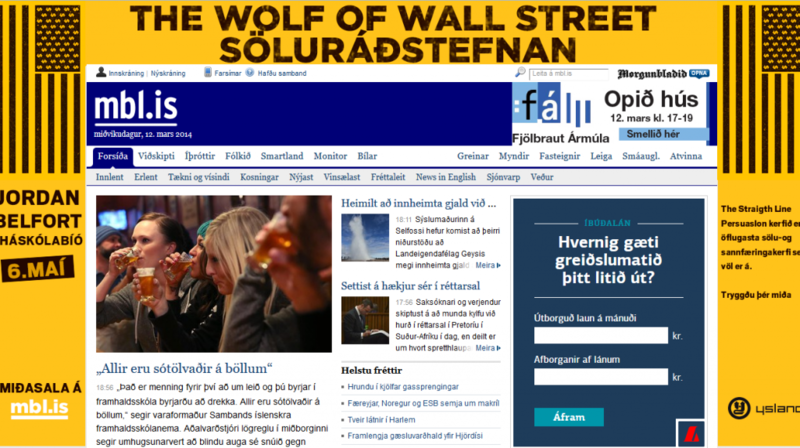 Icelandic Wolf of Wall Street Page. Usually when an American flag appears on the top right of an international site, it’s about what language you wish to use while browsing. Not so with this news site. Some evil looking American flags here. The film in the US tried to promote itself as anti greed but not necessarily anti-American. It doesn’t look like the international vibe of the marketing is only indicting Wall Street. The beer drinking looks fun. Somebodyisfromhere.com has no idea what the context of that is. This entry was posted in Intl, Movie, Patriotism, Uncategorized. Bookmark the permalink.